Comparisons with the 2019 Nautical Almanac Commercial Edition show that our spreadsheets remain sufficiently accurate for the year 2019 without the need for any changes or updates. Comparisons with the 2018 Nautical Almanac Commercial Edition show that our spreadsheets remain sufficiently accurate for the year 2018 without the need for any changes or updates. Comparisons with the 2017 Nautical Almanac Commercial Edition show that our spreadsheets remain sufficiently accurate for the year 2017 without the need for any changes or updates. A recent thread on NavList pointed out that a number of celestial objects appear in close proximity during the second half of February 2015. A quick application of the relevant spreadsheets show Venus and Mars separated by 24.7’, which is less than the apparent Moon disk size. The spreadsheet sailings.xls can be used in this case, since the angle of 1 minute of arc corresponds to the distance of 1 nautical mile on the surface of the Earth. With a Moon crescent in the vicinity of the two planets, it has been mentioned that Uranus is also in the area, separated from the Moon limb by about 2 degrees. While in the first example the parallaxes were essentially negligible (and hence the sailings.xls spreadsheet could be used to calculate the Venus-Mars angular separation), this is not the case for the Moon. 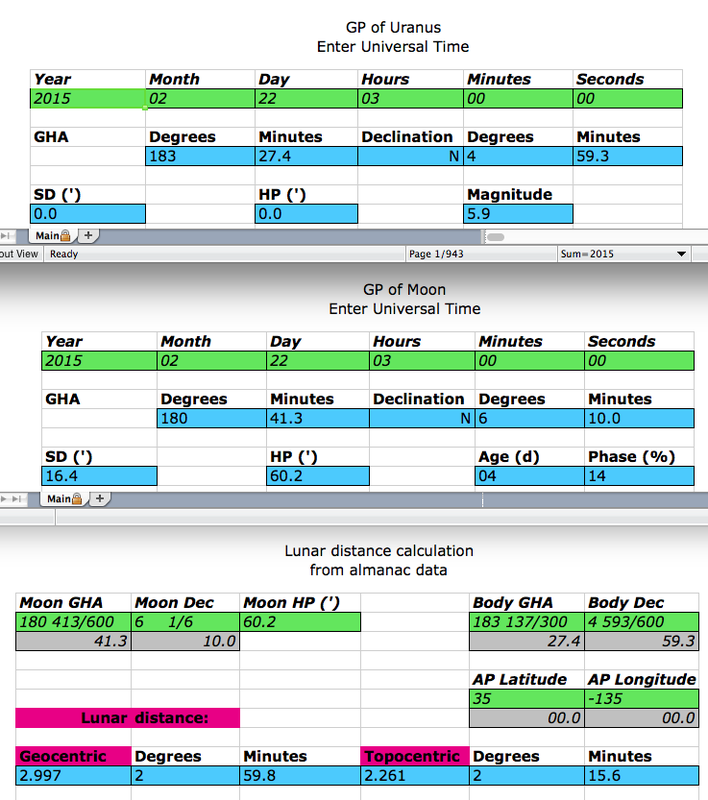 Therefore, to compute the lunar distance, there is a dedicated spreadsheet (ld_prec.xls) which takes the viewing location on the surface of the Earth (“AP”) as additional input to account for the parallax effect. Uranus appears slightly to the west of the (almost new) Moon crescent, so the interesting quantity is its distance from Moon’s illuminated near limb. Subtracting the Moon semidiameter (16.4′) from the topocentric centered lunar distance of 2° 15.6′ yields a value that is very close to 2 degrees. Ephemerides for the planet Uranus (along with Neptune and Mercury) are not listed in celestial navigation almanacs, as these objects are not suitable for astronavigation purposes. Nevertheless, we provide almanac spreadsheets for those three planets as well, since their data can be computed from the same VSOP87 planetary theory that we use for the other planets. In January 2015 Mercury is visible just northwest of Venus in the evening sky. Its horizontal parallax (HP) is twice that of Venus, so current Earth-Venus distance is about twice the current Earth-Mercury distance. 2015 Nautical Almanac Commercial Edition mentions the two planets in its “Do Not Confuse” paragraph on page 8. Spreadsheets mercury.xls and venus.xls show that the geographic positions (GP) of the two planets are very close to each other at this time. Comparisons with the 2015 Nautical Almanac Commercial Edition show that our spreadsheets remain sufficiently accurate for the year 2015 without the need for any changes or updates. As Frank Reed pointed in a recent NavList posting, Venus and Jupiter appeared close to each other in the morning sky of August 18, 2014, separated by about half a degree (30′, or by about the Moon apparent diameter). 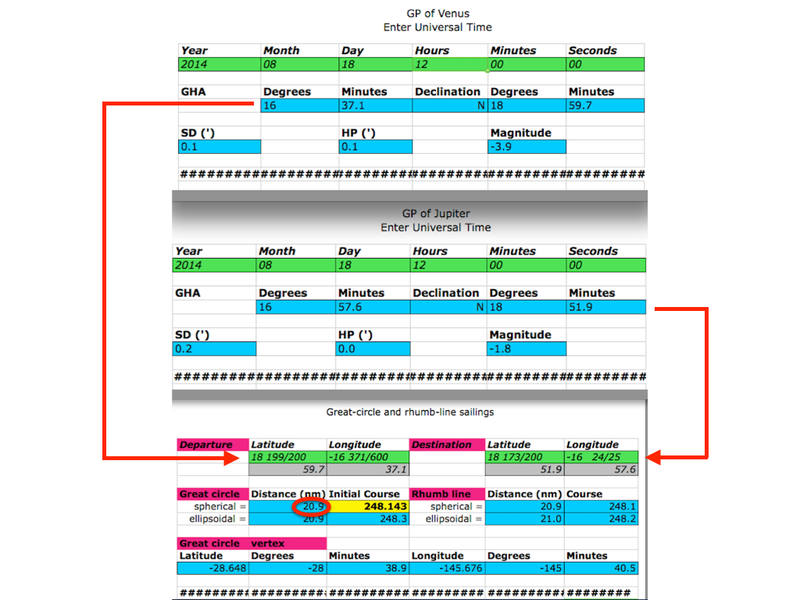 A quick use of spreadsheets venus.xls, jupiter.xls, and sailings.xls confirms this fact. 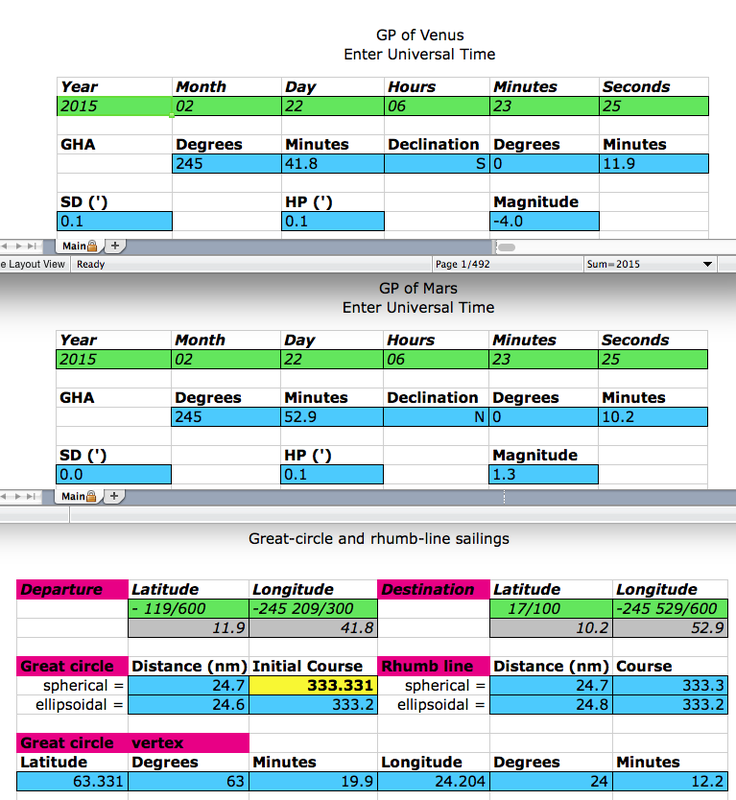 The first two spreadsheets provide the planets’ ephemerides. The third one calculates the great circle distance of the bodies’ subpoints (geographical positions) in nautical miles, which is numerically very close to their angular separation in the sky in minutes of arc. Additional details can be found on Steve Owens’s blog.